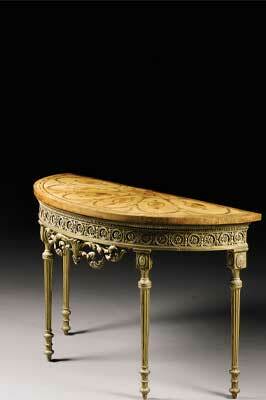 This little Chippendale table sold at Sotheby's in July for £386,500. The marquetry top is typical of the delicate mid-Georgian period and particularly of Chippendale's workshop. This is of a type known as a 'pier table' and is approximately 1.4m wide. It is intended to stand against the wall between two tall windows and very often had a mirror directly above. The crossbanding around the edge is in tulipwood (lLiriodendron tulipifera). It was almost certainly made for Harewood House, Yorkshire - for more information, click here - which has a large collection of Chippendale furniture. The style is known as neoclassical, which was promoted by the designer Robert Adam in the late 1760s. All the neo-classical elements are there, including rosettes, bell-flowers, pearl-framed oval paterae at the top of the slender fluted legs and very elegant marquetry.